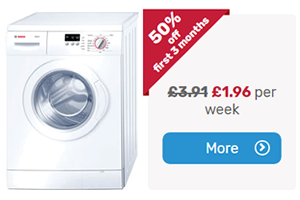 If you are looking to rent a washing machine, or any other white goods appliance, it make sense to go to a specialist in renting. My affiliate Forbes Rentals specialise in renting out new household appliances. They also rent out TVs and mobility scooters amongst other products. Forbes started out as a small local shop and have grown to a company employing approximately 180 staff. They are a family business and cover most of England (excluding central London & some postcodes). Modern appliances are extremely expensive to repair. They aren’t lasting very long either. So some people may now actually be better off renting instead. For a more detailed look into why, read this – is it worth renting washing machines and other appliances?